Easy to apply, easy to wash off! Trying to be a demon from the fiery pits of hell this Halloween? Would you like to be a bloodied up pirate this year or, maybe, just a silly clown? Perhaps you'd like to be some sort of demon clown?... Whoa, costume idea of the year! Well, if you want to be a passable imitation of any of these characters then you'll need to be sure to grab some of this washable red makeup! Whether you plan to make people fear you or you'd just like to make them laugh, it's completely up to you. 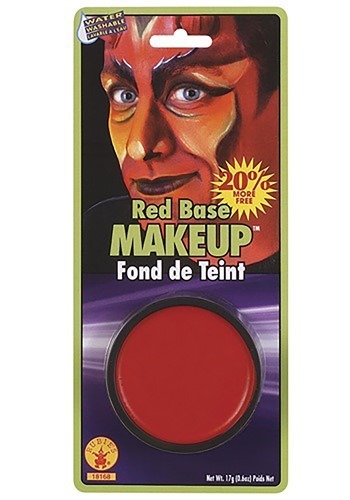 Although, finishing off your costume with this base makeup will be the deciding factor for the effect you have on other party-goers. Why have a mediocre costume, when you can go all out by simply applying this makeup? Become the most believable demon, clown, or pirate (or Demon Clown!) when you use this washable red makeup as the finishing touch to your holiday look!